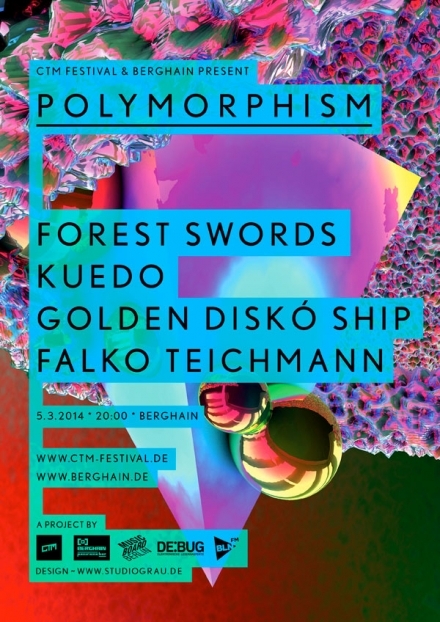 The 15th edition of Berlin's glorious CTM Festival is now a thing firmly in the past, but the organisers keep themselves and us busy, continuing their compelling Polymorphism concert series at Berghain with not one but two further editions this week. Starting tonight already, the 10th edition brings Englishman and noire sound explorer Matthew Barnes aka Forest Swords to the Friedrichshain stage, whose latest LP Engravings did not convince everyone on the NFOP team but nonetheless found some well-deserved honorable mention in Kelsie's list of remarkable musical objects of 2013. And, as far as we remember, his appearance at the 2013 edition of CTM Festival did leave us entertained and satisfied. Barnes' set will be accompanied by our favourite Kuedo, enlisted as a DJ, and local representative Golden Diskó Ship aka Theresa Stroetges, whose performance is part of CTM's ongoing Berlin Current project. The night will be closed by another DJ set by Berlin club mainstay Falco Teichmann. Check out the event's details over on Facebook or Resident Advisor.